When I drew this comic last year, I ditched my trusty Rapidograph for more expressive brush pen lines and pencil scratches. I recently went back and colored it. Hopefully the results are somewhere between a Xeroxed punk zine and a coloring book. Or like a guest appearance by The Clash on Sesame Street. Would you like an 11"x17" print of this or any other comic on the blog? Click here for details on ordering. Hey. You have been nominated for today's Blogger - Blogs of Note. Congrats! Congrats on the Blog of Note! Congratulations on the blog of note. 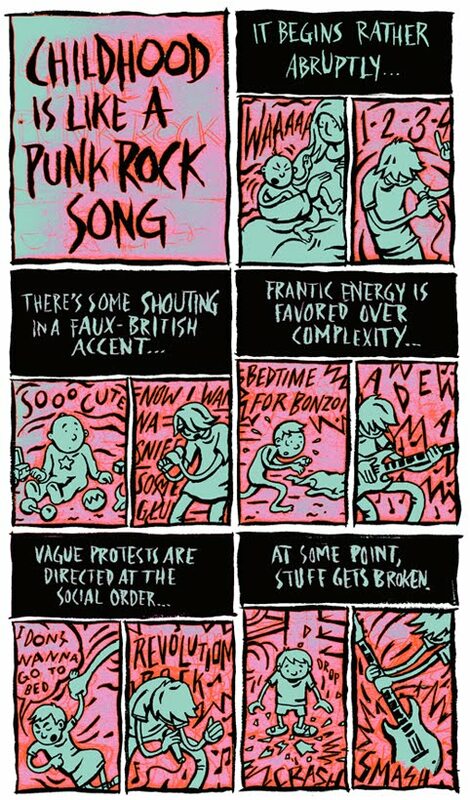 This is so true and I like the concept of a child growing up can be compared to a punk band. Pretty good stuff ! They remind me of the cartoon called 'Doug'. Used to air on Disney back in the days. It's ancient now. Keep up the great work and congrats on getting blog of note!!! =D does not come as a surprise seeing how u got some real awesome stuff here. sorry to sound like a total creep but I'm now following u on blogger. I went through your blog and I just love seeing the cartoons. It's so well done and the colours are all so nice to look at. This is Awesome! I'm so glad I stumbled upon this. Congrats on the blog of note. This is so awesome and so true! wish I could think of something like that! I'm also an illustrator as well, and it's great to see fellow artists having a feature in Blogs of Notes, very inspiring! Nice man, pretty truthful too. It all ends with a ringing note too. Congrats on being blog of note btw! I have followed your blog. I currently have a competition of stock price guessing where I will give the winner $50.00 for winning the competition. Check it out! wow nice comic,anyway congratulation for being on the blog of note. Congratulations on Blog of note. Love your cartoons. You've forgotten the part about wildly unpredictable bodily fluids. Hey nice comic! Also congratulations on being the Blog of Note today! Yes childhood is a very screamy time especially if you are the parent! Great comics! so true! childhood can be pretty crazy at times. congrats on being a blog of note today! must feel awesome... you have accomplished something! haha but yeah seriously pretty cool comics. You've just made a follower. So so true. I love the look of this. CONGRATULATIONS on being chosen a Blog of Note!! You're KU alumni, and I'm MU alumni, but I still like your stuff. There's still hope for world peace. This looks great to me! Keep up the good work and congrats on being recognized for working hard. Great blog here. Congrats on being a blog of note. Best of luck at your job. Looking forward to more comics. I just started following it today. Very creative. This is so true... nice blog as well keep it and you got a great comics..
Dude hey! These are funny! Your comics looks so good, I like your style. Childhood is really a punk!! and your comic is just fantastic. Oh,great post .I really like it ^^! good work! amazing you ! yeah i see the similarities but i do not think that childhood is like a punk rock song at all. But i see the connection. I really like your comics, the way you express yourself as an artist, keep up the good work! Very cool! if you're a fan of photography, check out mine. Nice! It's pretty true, which could be good or bad, depending on how you look at it. I wish I could have this on a T-shirt!!!! What a funny comic! Congratz so great blogs. keep it up and we will be waiting for your next post. I like to see and read more post of you.